A few weeks ago, the boyfriend surprised me with a ticket for Whitby Goth weekend, the play not the festival. The bi-annual festival inspired writer Ali Taylor to write about the play after being inspired by photos from WGW at a Gothic exhibition at the British Library. Taylor stated"And it was seeing photos of everyday people transformed into the most resplendent gothic dresses, suits and hat that grabbed my attention .....The fact that these people were dressed so extravagantly in a picturesque seaside town in Yorkshire while eating ice creams and chips screamed out for a play." 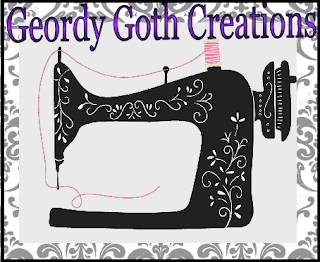 In recent years WGW s gained controversy with the numbers of normies and photographers visiting the Weekends to see the grand spectacle of goths donning their finery for some has turned the whole event into a joke for some. One of the themes explored in the play with through witty jibes. The Blogging Goth had a far more eloquent review than I'll piece together. I still want to share my perspective on the play. We found ourselves sat with a few of the goths, I heard one jokingly state, "I guess this is the Goth row". I quickly gandered to see there were more of a mature cultural sort rather than the darkly inclined, which surprised me, but then again it was Thursday night. We were first introduced with rather random but fantastic rendition of Sixousie and the Banshee's, Spellbound, later we learnt is the extroverted Geordie Goth, Belinda (Jessica Johnson). I assumed it was a rock musical. I was wrong. 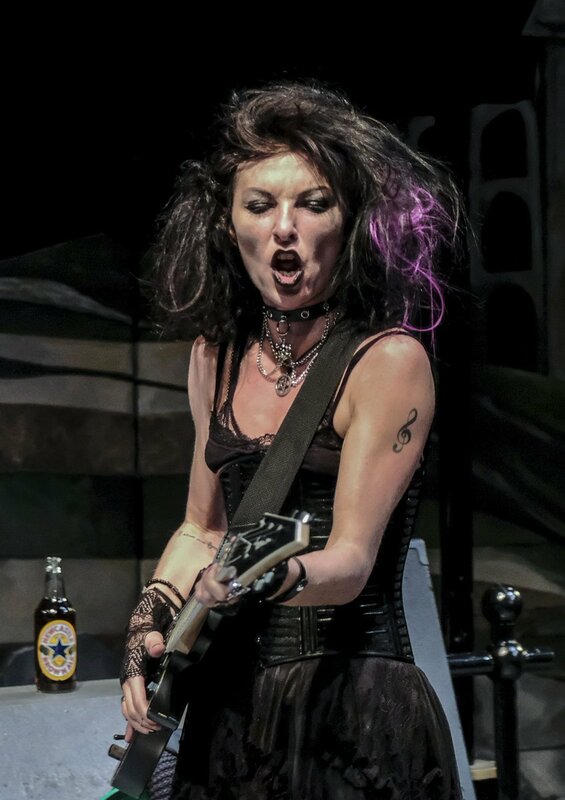 The play did cleverly utilise a well-chosen classic goth tracks from the 80's to both establish and summerise the scenes. The audiences are introduced to the other protagonists, underconfident but sweet plumber Kenneth (Sean McKenzie), and his daughter witty, sassy and sarcastic Anna, who arranges a date for her Dad after dealing with the loss of his wife, Cathy. Sadly, Ken's stood up by his date, and he meets Belinda whose desperate for a pint and hilariously helps herself to a drink. 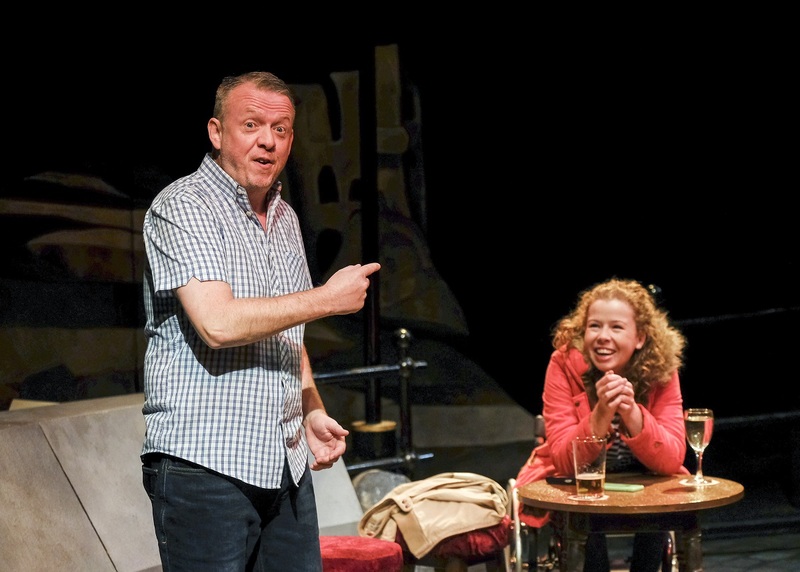 Soon they're back at Ken's for a haphazard one-night stand, that has the crowds in laughing, but some parts slightly cringe-worthy, enhancing the play's realism. The next morning, the trouble begins when Bram (Gurjeet Singh) shows up in their purple hearses, turning the head of the retirees of Benidorm of the North, Scarborough. Bram and Belinda move in for Ken and Anna just until the Whitby Goth weekend after getting there a gig at the Angel after Toyah Cox is unable to perform. Where Belinda and Ken start acting more like teenagers with Belinda stroppiness and with Ken discovering his inner goth by where his beige home and wardrobe gets a black and purple transformation. While the boyfriend gesturing to me about the joke of our colour scheme at home. This was where the play explores the internal prejudices of the Goth scene particularly with Bram prejudice, attitude and embarrassment of Ken referring to as a costumier (someone who dresses like a goth for the WGW) believing he's not a real Goth. I found this relatable personal experience when for my first couple of year I was called a wannabe and experienced this prejudice. A lot of goths I know have encountered prejudice from other goths. I'm not saying all new goths experience prejudices but it seems to be an uncommon experience amongst newer goths. From Ken's perspective, he's just finding himself and a style that ends up with him donning a mismatched style, that relatable to even to me, in my formative years I had many unsuccessful experimentations. It also explores themes sometimes, we might change our appearances to impress a new partner, and sometimes we lose ourselves. Anna who is the most adult and wise far beyond her years. She has grown up quickly caring for her dad taking and control after the loss her mam. Anna has the best intentions for her dad by trying to set him on blinds dates on Tinder. When Ken finds happiness with Belinda as she's not the choice for her Dad. However, in the intimate scenes where Anna is her room alone, we see Anna a vulnerable teenage struggling to come to terms with her Dad new life and need for her Mam. Anna copes by calling her Mam's mobile and leaves messages on the voice mail. It shows she still a teenager took on to much responsibility for years, and she's not allowed herself time to grieve. Belinda is the loud, brash in your face person. She comes across abrasive, a typical Northern Lass. She fearless doesn't take crap and a bit mad chasing off the charvs with her golf club. Despite her first, encounters the audience learns she the most accepting, tolerant person, who doesn't judge people by their appearance where she often rebuking Bram for his negative attitude towards Ken. Belinda'svery accepting nature which best demonstrated when Bram decides he no longer feels comfortable as a Goth becomes Simon and her general accpetance him being gay. I thought the basic story was a bit mediocre with Belinda deciding to find happiness with her new love interest in Scarborough or rejoin her old bands for an international tour. With Kenneth reliving his youth, Anna and Bram learning secretly sabotaging their parent's new love affair. 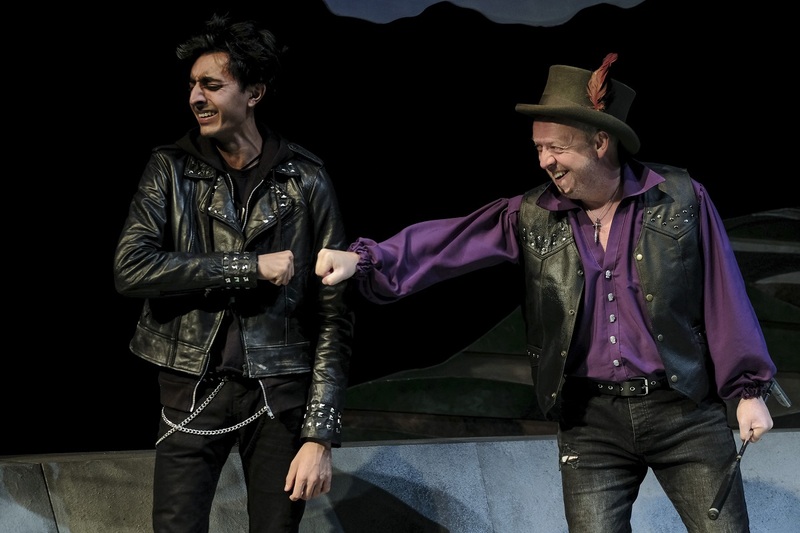 However, I liked the simplicity and realistic tribulations the plays explore, such as finding an identity, accpetance dealing with love, loss, grief and the personal goth politics. Despite the simplicity of the storey the script was fantastically written it's charming dysfunctional, and hilious. Particularly Taylor's use of self-deprecating humour my favourite is when Bram's highlight the irony of being a goth with his attempts to be an individual, he saw at least four other people wearing the same outfit. I feel the writing emotively engaged the audience with exploring the complex depths of the characters, which heightened by the superb acting performances. I felt was best demonstrated with Anna and Kenneth reminiscing about Cathy, for a moment I almost cried, forgetting it was played. When I saw Belinda being a more supportive motherly figure after Bram's disappointment of his dad it showed her in a different light. I have to commend Ali Taylor on his respectful, thoughtful and his humane portrays of goth through Belinda and Bram showing we're human but just a bit kooky. I like how he illustrated not just our the harassment we face from the outside world; also the communities internal struggles as well. I honestly, thought Taylor had written a play from an insider perspective of either being a goth or a former goth. However, I was surprised to learn he immersed himself in the Goth cultural via the Whitby Goth weekend learnt much from his encounters. Where he even me a range of professionals who often toned down the aesthetic for work. 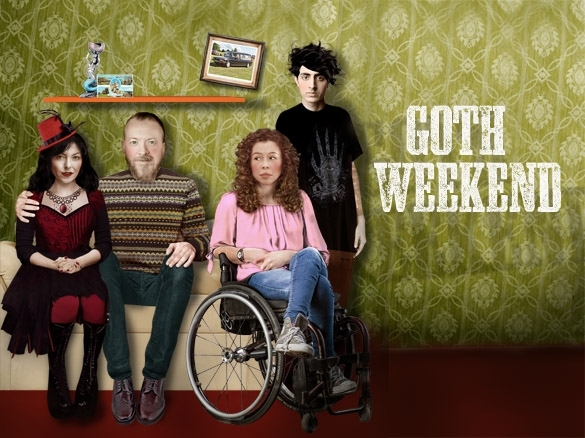 "But at Goth Weekend, they could go to town and express their true selves. And those true selves, I found, were generally gentle, thoughtful, introverted and sarcastic.:..... "Whitby Goth Weekend is so much more than costumes. It’s principally about Goth music, catching up with mates and having a place that, for a weekend, is entirely for everyone who is different and doesn’t fit it". According to Taylor. After the show the academic debate from Tim Synster and Dr Claire Nally which discussed the themes and accuracy of the show. It's even been recorded as a podcast for all free to listen. It was a quite interesting debate with various perspectives and polite disagreement. In case you fancy listening to it. This play needs to make its way to the states. Lol yeah. It becomes a world hit tour for the Goth community. Adapted for maybethe American audience There some dialogue that might make sense due the Geordie dialect. It so nice how much goth/alt cultural there has been recently. Sounds like a fun play! An "accepting, tolerant" person who refers to the poor and underclass as chavs. Lovely.